“Rocky Mountain Way,” the classic-rock nugget, is Joe Walsh’s signature tune. “It’s about living in Colorado, having left Cleveland and the James Gang and having no regrets at all,” Walsh said. Born in Wichita, Kansas, Walsh began playing guitar in junior high school after watching the Beatles on “The Ed Sullivan Show” in 1964. He built a considerable reputation as lead guitarist and lead vocalist for the notorious Cleveland-based James Gang. Such Walsh tunes as “Funk #49, “Tend My Garden,” “Walk Away” and “The Bomber” redefined the sound and concept of the power trio, earning high critical praise and three gold albums. The success of the James Gang brought wide popularity and endless touring, and, as the big bucks beckoned, Walsh turned the other way. In 1971, Walsh made the difficult decision to leave the James Gang and relocate to the open air of Colorado’s Boulder County. For months Walsh lived in the mountains and practiced ham radio operations. Full-time exposure to the rural landscape and easygoing, rustic lifestyle in the small towns of the Rockies seeded a new perspective. Walsh emerged with full force in 1972, forming a new group called Barnstorm with an old colleague and a newfound friend. 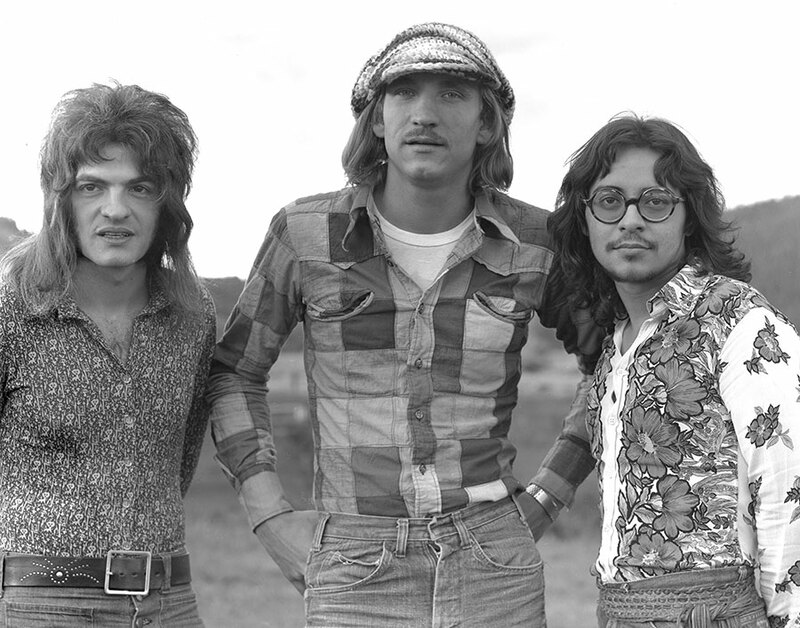 Joe Vitale, a confrere from their lean-and-hungry days at Kent State University and a refugee from the band Amboy Dukes, was five-foot five-inches of talent and energy on drums, tympani, gong, flute and synthesizer. Bassist Kenny Passarelli hailed from Colorado and provided a perfect complement to the music Walsh was bent on creating. Barnstorm was the first album ever recorded at Caribou Ranch, the facility high above Boulder that would soon gain fame as a destination studio. A long winter and spring at Caribou served Walsh and his band; Szymczyk handled the production and took care of the mixing. “When Joe and I were getting ready to do his first solo record, I had heard rumors of Jimmy Guercio’s Caribou ranch,” Szymczyk said. “So of course I wanted to suss him out and see what was going on. Guercio was going to direct a movie, Electra Glide in Blue, starring Robert Blake. He said, ‘I’m not going to finish the studio because I’m not going to be here for six months.’ We begged and pleaded with him. We definitely wanted to record there because it was only three miles from Joe’s house. We thought it would be good if we could break it in for Guercio while he was off making a movie, so he finished the room for us. The studio became their playground. Walsh moved away from the hard rock sound of the James Gang and explored his love of lushly textured production, and he freely indulged himself with spacy, open-ended songs. Passarelli and Vitale proved themselves adept at handling Walsh’s beautiful choruses, country tinges and pastoral pop hooks. He experimented with running his guitar straight into a Leslie 122 to get swirly, organ-like guitar tones, and he utilized the ARP Odyssey synthesizer to great effect on such songs as “Mother Says” and “Here We Go”; the music ranged to the lone hard rock track on Barnstorm, “Turn to Stone.” Barnstorm was a critical success. Record World found the album of laid-back fantasia “oh-so-tasteful” while Cash Box applauded the “genius arrangements” and “stunning harmonies.” The stage held its own magic, and Walsh built a larger Barnstorm band for the road, adding keyboardist Rocke Grace and later Tom Stephenson. Accompanied once again by Passarelli and Vitale, Walsh officially went solo the following year with his second album, The Smoker You Drink, The Player You Get—its title growing evidence of his comic persona. It was a commercial breakthrough. Recorded at Caribou Ranch with Szymczyk producing, the album became the first Top 10 hit of Walsh’s career; it went on to sell more than a million copies. Two songs received heavy airplay and opened up a massive audience for Walsh and his band—“Meadows” and “Rocky Mountain Way,” the latter inspired by Walsh’s move to Colorado. Co-written by Passarelli, the song was a perfect vehicle for his soaring slide guitar work and distinctive reedy tenor. “I always felt ‘Rocky Mountain Way’ was special, even before it was complete,” Walsh said. “We had recorded that before I knew what the words were going to be, but I was very proud of it. That was pretty much one shot at it, all playing at the same time. “I got kind of fed up with feeling sorry for myself, and I wanted to justify and feel good about leaving the James Gang, relocating and going for it. I wanted to say, ‘Hey, whatever this is, I’m positive and I’m proud,’ and the words just came out of feeling that way, rather than writing a song out of remorse. It turned out to be a special song for a lot of people. Barnstorm disbanded amicably in 1975, allowing Walsh to produce Dan Fogelberg’s Souvenirs album and to work at a less hectic pace on his third solo album. So What included the songs “Welcome to the Club” and a remake of “Turn to Stone.” During the recording of So What, Walsh invited members of the Eagles to contribute background vocals. Walsh played on albums by such artists as Stephen Stills, Ray Manzarek, Keith Moon, Michael Stanley, America and Rick Derringer. At the end of 1975, Bernie Leadon departed the Eagles, who, facing a tour of Australia and the Orient, drafted Walsh to join them. That led to a full-time collaboration between Walsh and the hugely popular West Coast country-rock quintet. Walsh’s addition gave the band a much-needed harder-edged sound, most notably on Hotel California, their biggest selling album, on which he co-wrote the hit “Life In the Fast Lane.” Walsh’s Eagles tenure gave him enhanced visibility, and he continued his pattern of successful solo albums. Walsh remains one of the most colorful characters in rock music. Passarelli played with a variety of musicians, including Elton John, Dan Fogelberg, Stephen Stills and Hall & Oates. Vitale continues his longtime partnership with Walsh; he also appeared with Fogelberg, the Eagles and Crosby, Stills & Nash.